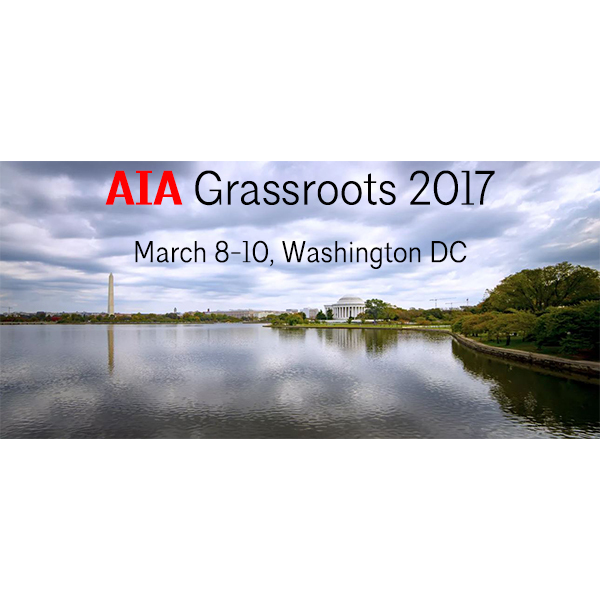 Grassroots 2017 is an exclusive event for AIA leaders of the American Institute of Architects. The agenda emphasizes component leadership and workshops designed to help component officers become more effective chapter and civic leaders. Members are given the opportunity to provide input on AIA initiatives, share information and ideas, and best practices with their counterparts from around the country. ­There are also many networking opportunities with one another and AIA national staff. Registration is open from 7am–6:30pm. Workshop 2: Implicit Bias and Its Impact on Leadership and Decision Making. Led by Dr. Shirley Davis CSP, President and CEO, SDS Global Enterprises, Tampa. There is a fee for each pre-Grassroots workshop. Learn more about the pre-Grassroots workshops. Tours include: The Smithsonian Arts and Industries Building and The National Gallery of Arts East Building. Learn more about the tours. Registration and the member resources center is open from 6:30am–6:30pm. 4:15–5:45pm Developing as a Leader workshops. Learn more about the Grassroots workshops. 9:30–11am Developing as a Leader workshops. Learn more about the Grassroots workshops. Staffed Components receive up to three (3) free registrations for the component executive and two (2) elected leaders; all-volunteer (unstaffed) components receive up to two (2) free registrations. You MUST use your chapter code to register. Workshop 1: Developing a Partnership between Board of Directors and Component Staff. Cost: $100 per team; limited to 45 teams. Both the component executive and the component president and/or president-elect must attend together. Workshop 2: Implicit Bias and Its Impact on Leadership and Decision Making. Cost $50.00. Breakfast and lunch are included on Thursday and Friday for all registered leaders. The price is included for registered leaders. The cost is $75 per guest. To further AIA’s greening efforts in the planning of this meeting, we ask that you cancel any request in writing by February 24. Registrations received by February 24, 2017, will appear on the advance attendee roster. Those registered after this date will appear on the final attendee roster sent after the meeting. You can book directly with the carriers below, or use your own agent. Another option is to use the AIA’s official travel agency, Ovation Corporate Travel, by calling (800) 925 4055, or (516) 624 0308 for international callers, on Monday-Friday from 9am–8pm ET. Reservations and ticketing are available at Delta.com, through Ovation Travel (see below), or your agent. When booking at Delta.com, select “Book a Trip;” click on “Advanced Search,” and enter the meeting code NMLNR in the box provided on the Search Flights page. Reservations may also be made by calling Delta Meeting reservations at (800) 328 1111 Monday-Friday 7am–7pm CT. There is a ticketing fee for booking through the (800) reservation number. United Airlines is pleased to offer discounts of 2 percent to 10 percent off published fares. Save an additional 3 percent off by booking your own reservations at www.united.com. Choose your flight times, and access your meeting discounts by inserting ZXBU743699 in the Offer Code box. Or Call your travel professional or United Meetings at (800) 426 1122 for reservations. Amtrak offers a 10 percent discount off the best available rail fare to Washington, DC for Grassroots. Special Grassroots fares cannot be booked on the Amtrak website, so to book your reservation call Amtrak at 1 (800) 872 7245 or contact a travel agent. Refer to Convention Fare Code X86D-964 when making your reservation. This offer is not valid on the Auto Train and Acela Service. Fare is valid on Amtrak Regional for all departures seven days a week, except for holiday blackouts. ­Offer valid with Sleepers, Business Class or First Class seats with payment of the full applicable accommodation charges. Local and state components are in charge of scheduling meetings with legislators on behalf of their conference attendees. A sample scheduling request is available for your use, which is attached here. Remember that these meetings can be with the legislator and/or their staff, and the scheduling process takes persistence. Offices receive many scheduling requests per day, so follow up on your request with the scheduler will be necessary. As each meeting is scheduled, please enter the meeting information in our online portal. One big difference this year is that rather than having general talking points, we will be assigning issues to each meeting as they are scheduled, which is why it is important for you to report your scheduled meetings as early as possible. This is so we can have a greater impact on Capitol Hill by talking with legislators about the issues they are most likely to be directly involved in. We will be posting the assigned issues in a spreadsheet on the Grassroots page. Hill leave-behind materials and talking points will be picked up upon arrival in DC by the person designated in the online scheduling portal when the meeting was submitted. If you have any questions, please email AIA Advocacy staff. Throughout his career in urban design, planning, and architecture, Peter Calthorpe has been a pioneer of innovative approaches to urban revitalization, community planning and growth, and regional planning and design. In 1983, Mr. Calthorpe founded the award-winning firm of Calthorpe Associates devoted to sustainable urban design and planning globally. He is one of the founders and the first board president of The Congress of New Urbanism. Through design, innovation, publications, and realized projects, Peter Calthorpe’s 30-year practice has helped solidify a global trend towards the key principles of New Urbanism: that successful places–whether neighborhoods, towns, urban districts or metropolitan regions–must be diverse in uses and users, must be scaled to the pedestrian and human interaction, and must be environmentally sustainable. Dr. Joan Clos is the Executive Director of the United Nations Human Settlements Programme (UN-Habitat), at the level of Under Secretary General by the United Nations. He has held this office since October 2010. He also served as the Secretary-General of the United Nations Conference on Housing and Sustainable Urban Development (Habitat III) held in Quito, Ecuador in October 2016. Born in Barcelona, he is a medical doctor with a distinguished career in public service and diplomacy. He was twice elected Mayor of Barcelona, serving two terms from 1997 until 2006. He was Minister of Industry, Tourism, and Trade of Spain between 2006 and 2008. Prior to joining the United Nations, he served as the Spanish Ambassador to Turkey and Azerbaijan. The Honorable Mayor Pugh was first elected to the Baltimore City Council in 1999, where she served until 2004. She now serves as the city's Chief Executive and is responsible for proposing a budget, signing legislation into law, appointing departmental directors, and overseeing the city's day-to-day operations. The Mayor also represents the city on the state, national, and international levels. First and foremost, Mayor Pugh prioritized the US Department of Justice investigation into the Baltimore Police Department. Michael Berkowitz joined the Rockefeller Foundation in August 2013 to shape and oversee the 100 Resilient Cities. Previously, he worked at Deutsche Bank (DB), most recently as the Deputy Global Head of Operational Risk Management (ORM). In that capacity, he oversaw the firm’s OR capital planning efforts, served as a primary regulatory contact, and connected the myriad operational risk management efforts group-wide. He held multiple other positions at DB, including Chief Operating Officer of Corporate Security, Business Continuity (CSBC) and Operational Risk Management. During this time, he also served as the head of the Bank’s Protective Intelligence unit, designed to assess and analyze security and geopolitical threats to the bank, its staff, processes ,and information. In 2014, the US Green Building Council named her a LEED Fellow, reflecting her achievements as a LEED professional as well as her contributions to the green building community. Her current work includes reuse of historic buildings at the historic St Elizabeth’s campus in Washington, DC for the US Department of Homeland Security, and for the State of Vermont offices in Waterbury, and ongoing work at Trinity Church in the City of Boston. Tom Dallessio is a nationally recognized urban planner, non profit leader and educator with more than three decades of experience in city and regional planning, public policy, and non profit management. He comes to Next City from the Center for Resilient Design at New Jersey Institute of Technology, where he was the Center’s founder and director. He continues to be an adjunct professor at NJIT, teaching land use and infrastructure planning. Mr. Dallessio got his start in nonprofit management at Regional Plan Association, where he directed RPA’s New Jersey office and managed six New Jersey Mayors’ Institutes on Community Design, and promoted affordable housing, transportation finance and property tax reforms. He served as a senior policy adviser to New Jersey governors Christine Todd Whitman and Donald T. DiFrancesco, drafting environmental preservation law and serving as the governor’s representative to the state’s planning commission. Elizabeth Chu Richter was president of the Texas Society of Architects in 2007. Throughout her career, she has taken a strong interest in public outreach and design excellence. She was executive producer of a popular radio series on architecture and has served on numerous AIA component design juries, as well as chair of the AIA Gold Medal and Firm Award Advisory jury, and a member of the AIA Regional and Urban Design Award jury. Her own design contributions were recognized in 2001, when she received an AIA Young Architects Award. Ms. Richter serves as CEO of Richter Architects based in Corpus Christi, Texas. Her firm is committed to design excellence and has received national, state and local AIA design awards. Richter Architects has a diverse portfolio and was recipient of the 2011 Texas Society of Architects Architecture Firm Award. Jeff Speck is a city planner and urban designer who, through writing, public service, and built work, advocates internationally for more walkable cities. He leads Speck & Associates, a private consultancy offering design and advisory services to North American municipalities and the real-estate development industry. As director of design at the National Endowment for the Arts from 2003 through 2007, Mr. Speck oversaw the Mayors’ Institute on City Design and created the Governors' Institute on Community Design. His recent book, Walkable City: How Downtown Can Save America, One Step at a Time, is exerting a profound impact on the design of communities nationwide.